This is a foldable that you can go through with your class. Has a data set at the top of the inside that you can go through with your students so that they have an example. Needs to be printed front and back and folded to the line in the middle and cut twice (once on each side). 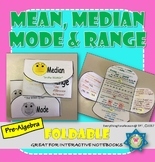 Mean, Median, Mode and Range Foldable:This foldable to practice measures of central tendency. 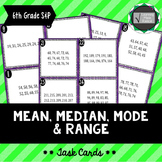 It has blank spaces for students to complete definitions for Mean, Median, Mode, Range and outlier. It also contains an example for students to practice their skills. Can be print out in color or B&W. This foldable includes key words for mean, median, mode and range. It is a great study tool for students. This foldable has cloze notes for mean, median, mode, and range. Students can fill this out and use is as a great reference. An easy way to introduce or review basic statistics. Students can use the foldable to quiz themselves or to find how to do one of the four without looking at a long page of notes. Examples are included inside the flaps. Do you use foldables? 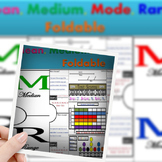 This foldable is for mean, median, mode and range. Print the page, fold so that you make a "window" and then cut into four separate windows to open. For each term there is a definition and an example. 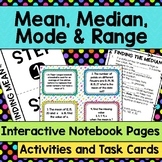 Great for math notebooking! 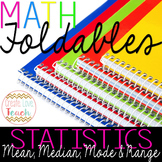 Foldable or interactive notebook handout for measures of central tendency Copy front to back! Students can use this foldable for note-taking or in interactive notebooks. Easy MMMR Foldable Notes for interactive notebooks or as a handout! Includes answer key. 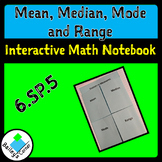 Mean, Median, Mode, Range, and Mean Absolute Deviation Foldable A five-door foldable featuring measures of center on the left side (median, mode, and mean) and measures of variability on the right (range and mean absolute deviation). Notes are fill-in-the-blank with an answer key on the last page.